The Department of Communication offers the Bachelor of Science in Communication for students interested in the study of - and careers in - advertising, broadcasting, corporate communication (including public relations), film and journalism. Secondary teacher certification plans are offered in speech and journalism in conjunction with the College of Education and Human Development. 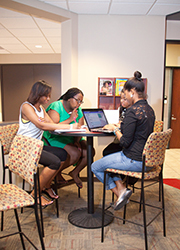 A new student beginning study at Lamar University must meet all admission requirements of Lamar University. Transfer students or students who wish to enter Department of Communication programs by change of major must meet the same requirements or hold a minimum grade point average of 2.00 or better. Grades of “D” are not accepted as course completion for required classes in departmental majors, nor are they acceptable as course completion for classes to be used as professional electives by student majors within the department. Lamar University also offers a Bachelor of Science in Communication entirely online. Click the icon below for class schedules and an overview of the program.